Ormskirk and Bootle Group annual crown green bowling competition took place at the Dog and Gun Bowling Club in Aughton, near Ormskirk and this year’s event was again organised by John Glover, a member of Park Hall Lodge No 8375. 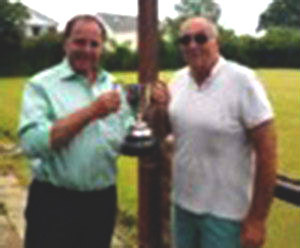 Graham Chambers (left) presenting John Metcalf with his winner’s trophy. This bowling competition, which is an annual group event, is open to all the members of the group and attracted 12 attendees this year, but unfortunately only seven players were playing on the day representing a number of the lodges and chapters from within the group. On the day the weather was very good which enabled a full competition to be played. Ormskirk and Bootle Group Chairman Graham Chambers, having only returned from his holiday that lunch time, managed not only to attend but also to take part in the competition. The winner of this year’s tournament cup was John Metcalf of St Michael’s Lodge No 5756 with Brian Cunliffe of Fermor Hesketh Lodge No 1350 being the runner up and receiving the runners-up shield. Both John and Brian will be going on to represent Ormskirk and Bootle Group at the Provincial Bowling Tournament this year. 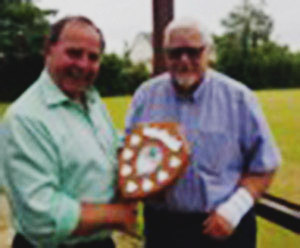 Graham Chambers (left) presenting Brian Cunliffe with his runner-up shield. Landlord of the Dog and Gun, Mike Barker of Stanley of Bickerstaffe Lodge No 3511, provided a very welcome platter of chips, sausages and bread during the afternoon’s short break, which was enjoyed by all. In presenting the cup and shield, Graham congratulated John and Brian and wished them well in the Provincial tournament. Graham thanked all for attending and he hoped that this event would have greater support from the members of the group in the future. He concluded by thanking John Glover, the group bowls representative, for organising this special annual group event and also for his work on the committee of the West Lancashire Provincial Bowling Tournament at which he represents the Ormskirk and Bootle Group.